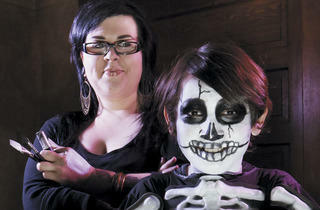 A Chicago aesthetician lives for the tenth month each year, when she can perform Halloween Extreme Makeovers. Turning a childhood passion into a career, the 32-year-old Florida native moved to Chicago seven years ago and eventually wound up in aesthetician school here. “I was bored out of my mind in Florida,” she says, noting that a particularly conservative stripe of Christianity in the Florida Panhandle meant that, when she was a kid, “a lot of people seriously still thought Halloween was evil. You were supposed to go to church instead of trick-or-treating.” Happily, Attwood’s mom, a retired kindergarten teacher, embraced All Hallows Eve, making it fun for her kids. Today, Attwood works as an independent freelance makeup artist (go to allisonattwood.com for info). She’s worked frequently for MAC cosmetics, including behind its makeup counter at Marshall Field’s on State Street (which became Macy’s while she worked there). Every October she got to help fulfill a new generation’s dreams. 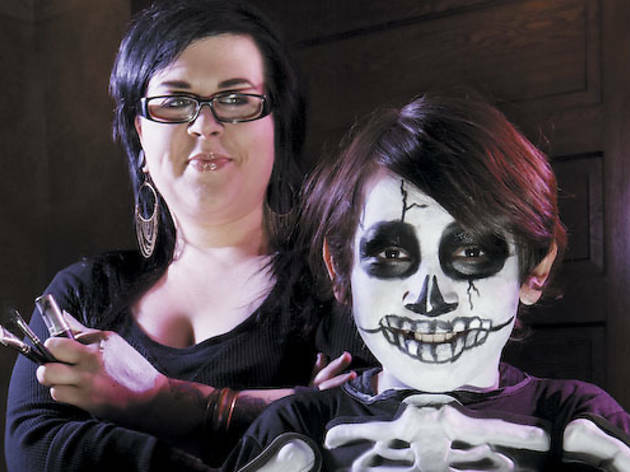 MAC artists can be booked for Halloween makeovers for adults—but Attwood and her coworkers also did them for kids informally at no charge when they had the time. “For me, it was the best part of the year,” she says. That’s the magic of makeup for Attwood. She learned early not just how it made her feel, but how it could transform others. She has one brother three years her junior, “so we were constantly fighting,” she says. But one or two Halloweens after she did her own princess face, “I remember doing my brother’s makeup for the first time. He was G.I. Joe, and I did camouflage all over him. Instead of fighting, that became one of those quiet moments where it was, ‘Oh my God, we’re actually getting along.’ We happily went trick-or-treating together, too.” Lesson learned: Halloween and a little makeup can bring anyone together, even a pair ofwarring siblings.